Panic attacks are a symptom of panic disorder, which falls under an even larger umbrella term of anxiety disorders. They touch women of all ages, though they tend to show the first symptoms in early adulthood. The symptoms of panic attacks affect the body and mind alike, often leaving women exhausted, confused, and scared of subsequent episodes. They also cause a great deal of stress, because they resemble the symptoms of a heart attack. Read on to learn the most common symptoms of panic attacks and how to be sure they do not indicate a more serious condition. Since the symptoms of panic attacks and a heart attack are so similar, each episode of a panic attack should be treated as a possible heart attack. It is impossible to diagnose a heart attack at home, so a prompt and proper evaluation in a hospital setting is strongly advisable. 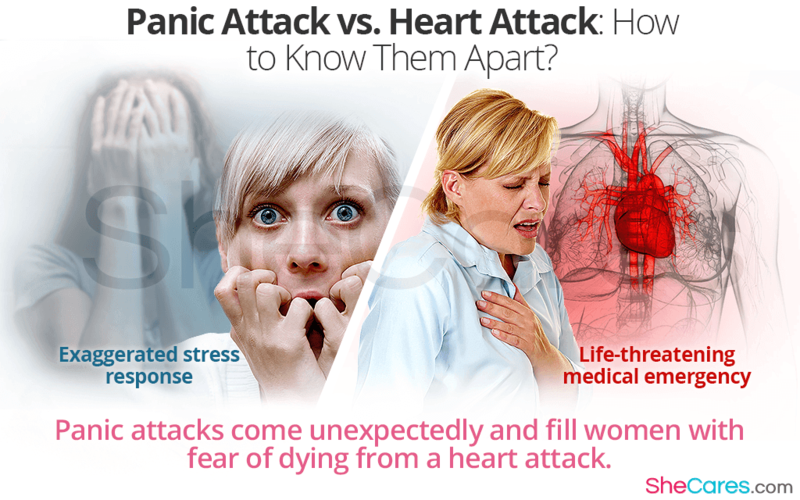 Panic Attack vs. Heart Attack: How to Know Them Apart? Almost all of the physical symptoms of panic attacks can be experienced during a heart attack, which increases the fear of dying and distress in women going through a panic attack. Panic attacks are rarely dangerous and do not lead to a heart attack. They result from an exaggerated stress response of the body and tend to produce more symptoms than a heart attack, although there are exceptions. Sometimes long-term and untreated panic attacks cause phobias and in severe cases, they might lead to a suicide. For that reason, it's important to never underestimate the symptoms and if in any doubt, always consult a professional. A heart attack, however, is a life-threatening medical emergency that requires immediate attention. It occurs when there is a sudden blockage in oxygen supply to the heart, and the heart does not get enough oxygen. If blood flow is not restored within a few minutes, the heart tissues begins to die. Once a heart attack is ruled out, you should consider starting psychotherapy or a medication regimen to prevent subsequent episodes from occurring and return your life to normal. Besides the traditional treatment methods, there are numerous alternative treatments from acupuncture and meditation to adequate diet that can help you control your panic attacks before they take control over you. Learn more about how to cure panic attacks.